Now that Christmas is over, you're probably stuck with a myriad of leftovers. I know, it was days ago, but the only leftovers that matter are still good. Especially that ham. Mmmm...ham. It's no secret around here that ham is my favorite meat. (I even have a little 'I love ham' song that my son has started to sing. It's so cute...) I usually make one a couple times a year because it's such an easy, delicious meal. If you grab a couple when they're on sale and stick them in your freezer then it's awesome, too. It's a great budget friendly food because you can get quite a few meals out of one ham. Super awesome, right? 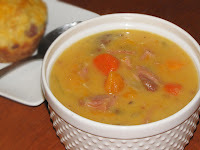 With the leftovers from one ham, I got this soup (three to four meals worth) and some super cute ham and cheese muffins (two to three meals worth). You just can't go wrong. Well, since there's always a bunch left over, I look for creative ways to use it up. Now, soup may not be that creative, but it is tasty. It's one of the best ways to use it up because you can soak that bone and get all that ham-alicious flavor in every bite. I did this chowder-type soup with sweet potatoes as the secondary feature because, well, they also rock. I love the flavor of sweet potatoes and if you aren't sick of them from Thanksgiving and/or Christmas, give this soup a whirl. It's my new favorite and it's perfect for a lunch or dinner entree. I had some for lunch today and I just couldn't stop saying, "This soup is so good." I was even annoying myself but I just couldn't help it. 1. Heat butter and oil in large pot. Add celery, carrot and onion and cook over medium heat for about 5-7 minutes or until soft, stirring occasionally. Add garlic and cook for 1 minute more. 2. Add broth, potatoes, and ham bone with ham. Bring to a boil then reduce heat to low and simmer for about 1 hour, stirring occasionally. 3. When the meat is tender, remove bone from pot and set aside to cool. 4. Whisk together milk and cornstarch in a small bowl. Slowly add to the pot while stirring continuously. 5. When bone is cool enough to handle, take off the meat and cut/shred into small chunks. Add meat back to pot. 6. Add salt and pepper, stir well, then bring to a boil. Boil for about 2-3 minutes or until soup is bubbly and thick.